This article provides a fascinating summary of the content appearing in Ben Hewitt’s book, Home Grown, which was the most challenging and empowering book I’ve read in some time. The most impressive aspect of his family’s story is just how remarkably resourceful his two boys are. At the ages of 12 and 9, these boys are actually productive members of the family. 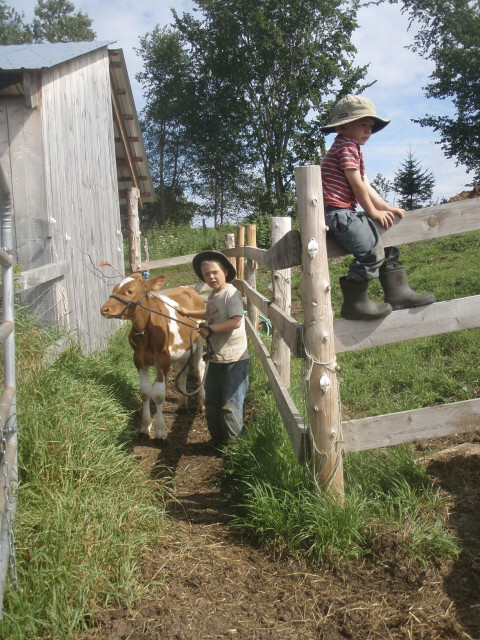 They engage in meaningful chores like tending to farm animals, splitting firewood, making their own hats out of wool they felted from their own sheep, can be trusted to collect wild edible mushrooms, and on and on. These kids aren’t micro-managed, and they are trusted with great responsibility. They’ve independently handled potentially dangerous axes, hatchets, knives, and traps, from a young age. Even at the tender age of five, onlookers stared at the children open-mouthed while watching the kids in disbelief as they unsheathed fixed-blade knives (always available and attached to their belts) to engage in chores on the farm or out in the community. They are more proficient in bushcraft and survival skills than most outdoor-oriented adults could ever hope to be. I even place myself in this category. The brothers roam the fields and forest for hours at a time, build watertight structures out on the land, and always carry a hook and line in their pockets just in case. Sometimes they’ll build a fire with their flint and steel in order to cook freshly caught trout, cleaned and prepared themselves, on a flat rock heated by the conflagration that they can be trusted to keep under control. I could go on with further details, but the effect would only reduce them to the level of mythology. I am providing only a glimpse of how set apart they are from the average expectations society has of young kids. To me that is the key. We need to do something about our ridiculously low expectations. Whether or not we do something as radical as turn kids loose to pursue their own education by following their passions, we parents shouldn’t leave it to the specialists to shoulder the full burden of educating our children. I think most of us already intuitively realize this, but in practice we often don’t do much about it (due to distractions, busyness, and often a lack of confidence). Ben’s family is completely different from mine. On Sundays his family splits firewood, while mine is in church. His children have never been in a classroom, while mine attend public school. They live on a homestead (MY DREAM! ), and we live in the city. And yet, in some ways we’re kindred spirits. Each of us can learn something and be challenged by them. I found myself wrestling with the fact that one of the themes of my upcoming book is that I needed to leave institutional schooling while in my freshman year of college, in order to learn anything. And here I am sending my own kids to public school! Rather than sweep this under the rug, I need to wrestle with this. My own experience in school was stifling, too controlled, and didn’t promote any independent thought whatsoever. Ben Hewitt dealt with this by dropping out of high school when he reached the age of 16, and he has become a tremendously talented writer by simply practicing this craft. As with many skills, writing is “better caught than taught.” I’m not advocating dropping out of school, or pulling kids out so a “more pure” form of education can be sought through unschooling. However, Mr. Hewitt makes a most compelling case. My wife and I must strive intentionally to help our kids have a better educational experience than I had. This can be done in more ways than one, and regardless of your perspective on the matter, nearly all of us most entrust our children with more responsibility. They have the capacity to develop meaningful practical skills that will serve them will throughout life. I am increasingly excited to share my passions with my children, and to watch them pursue knowledge and interests without realizing that it’s an education. A key ingredient for success here is to leave my inherent perfectionism behind, and to not listen to my own insecurities that want to tell me that my efforts are inadequate. Of course I’m inadequate, but doing nothing is unacceptable. For some time I’ve observed the necessity of challenging my kids physically, by providing them a physical education at home or in the woods. Slowly I’m extending this to other areas that I see are lacking in their lives. For example, last night I realized that they don’t know the first thing about classical music. Rather than listen to Marketplace Money on NPR by myself last night while doing the dishes, as I usually do, I cranked up the final movement of Beethoven’s 9th Symphony (The Ode to Joy) for the full 20 or so minutes. I got tingles up my spine as the choir belted out the well-known chorus. I delighted in sharing just a bit of the uplifting message to my children, while also reveling in the fact that the composer was deaf when he composed this great work. They found that to be rather remarkable when thinking about the numerous instruments and voices that he combined into this great achievement. Similar conversations could be had about other musicians like Mavis Staples, Johnny Cash, or Bob Dylan. The inevitable comment, “His voice sounds funny,” is an opportunity to share why Bobby means so much to the culture. And doggone it, I don’t need to be a musicologist to instill some of this in them! The same goes for other fields of interest that any well-rounded person should be somewhat proficient in. One such area is geography. My kids’ understanding in this area is nowhere near the level that I want to see it at. Rather than complain, I need to encourage further study. I plan on placing world maps in their rooms. Perhaps we could engage in paper airplane journeys to random countries, and then check out books from the libraries to learn more about the countries and people in these places upon which our planes land on the map. More non-fiction books from the library will be helpful. When we can afford it, perhaps a subscription to National Geographic, etc. We’ve also begun a weekly documentary night. Netflix has a plentiful supply of these, and the experience has exceeded my expectations greatly. The kids are not only learning about other areas of study than they’ll receive in school, but more importantly, their curiosity is stoked as they slowly take on a broader scope of the world. Our problems were put in perspective, for example, when they recently observed the living conditions of poor families in Guatemala.